Here’s a complete step by step guide on how to downgrade macOS High Sierra back to macOS Sierra on your Mac. macOS High Sierra is currently in beta, and it’s highly likely that users might want to revert back to macOS Sierra to introduce stability back into their lives. 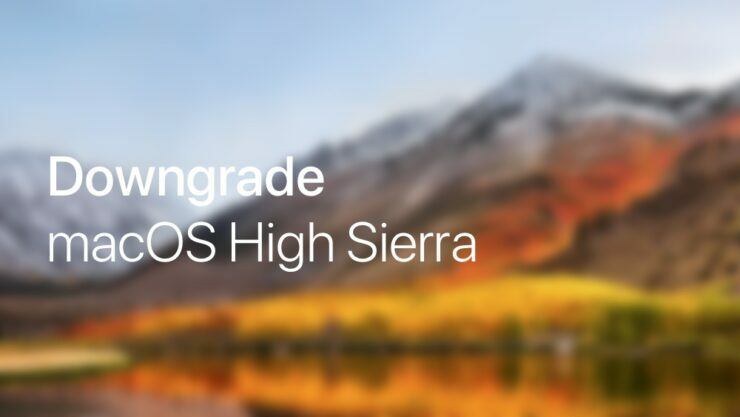 If that is the case for you as well, then follow our downgrade macOS High Sierra guide below. Before you do anything at all, make sure that you have backed up your data in a safe and secure location. This process will erase everything off your Mac, forcing you to start over fresh. So please, use an external storage medium or a cloud-based service to secure all of your files, photos, documents, etc. You will require a macOS Sierra installer USB. Follow the guide posted here on how to create one: How to Create macOS Sierra Bootable USB Drive. Make sure that you have your Mac’s power adapter connected so that things run smoothly as possible. 1. Plug in the macOS Sierra USB installer which you created and restart your Mac, or turn it in if it’s powered off in the first place. 2. Once you hear the Apple chime, hold down the left Option key on the keyboard. 3. You should see a number of options on the display. Select the macOS Sierra installer USB and hit the Return key on the keyboard. 5. You are going to format your Mac’s internal drive, so select it from the left hand side pane. 6. Once selected, click on the Erase button at the top. 7. Give the drive any name. Select the Mac OS Extended (Journaled) option under the Format drop-down. Select the GUID Partition Map under the Scheme drop-down. 8. Click on the Erase option to format your drive. 9. Now close Disk Utility and you’ll be taken straight to the main menu. 10. Select the Install macOS option and follow the on-screen instructions for installation. Just make sure you select the internal Mac drive (which you formatted above) as an installation source. That’s all.